Looking for a low carb Easter treat? 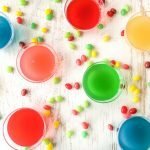 Try these low carb jelly bean gelatin snacks! Easy to make and virtually no calories or carbs and the added benefit of using healthy gelatin! Add 1/4 cup cold water and gelatin to a pyrex measuring cup. Whisk well. Pour in Torani sugar free syrup and then the 1/4 cup of boiling water. Whisk until the gelatin dissolves. Ad in the lemon juice and the 3 tablespoons of cold water. Mix and then pour into containers. Refrigerate for 1 or 2 hours until set.